Photos and text by the editor unless otherwise noted. Sunday 1 November 2015 - Lancer Association Reunion, Lancer Barracks. Saturday 21 November 2015 � Official opening of Light Horse Reserve, Eastlakes. The site, Rosebery, where the 1LH prepared for deployment to Egypt in 1914 is of great significance to the Regiment. CLICK HERE for the invitation from the Mayor of the City of Botany Bay. Sometime, when ACE is ready � ACE will roll into Lancer Barracks. 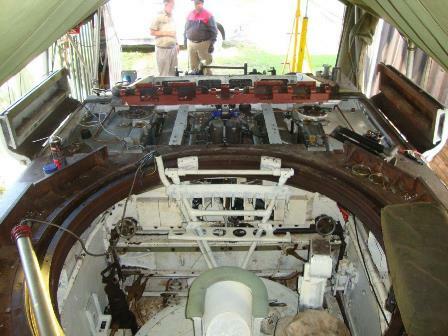 Everyone should make certain they see "Mephisto" (a WW1 German A7) at the AWM in Canberra, it will be on display from 27 July 2015 'till April 2016. No official report from the Regiment this time. There has been too much going on. A bit of a problem with the Protected Mobility Vehicles. The Army has chosen to designate them transport rather than armoured vehicles. Meaning the crew commander becomes a co-driver, not being required to develop and exercise vehicle command skills, vehicles do not carry an effective assault/protection weapon and are only expected to travel in convoy not using vehicle fire and manoeuvre tactics (bit hard without a weapon anyway). Proper vehicle husbandry is not mandatory with a transport vehicle. The PMVs are still allocated to the Regiment for training and provision of lift for reserve units on exercise; but troopers have to train as a Cavalry Scout in order to gain a recognised ECN. 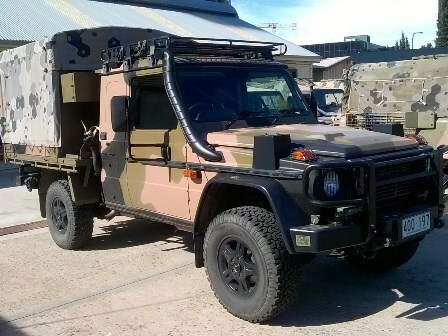 The replacement for the Land Rover, a Mercedes no-less was recently spotted at the Regiment. In honour of Centenary of ANZAC, Elizabeth Smith accompanied by the Regimental Band was recorded singing "I was only 19". The Museum volunteers have achieved a great deal over the past six months. 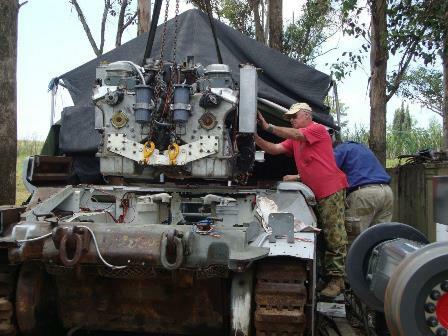 There has been a final problem with ACE, our Matilda Tank restoration. A radiator we had obtained and restored has failed and we are having difficulty finding a replacement. In the Museum building the grants Ian Hawthorn has been able to secure have been put to good use. 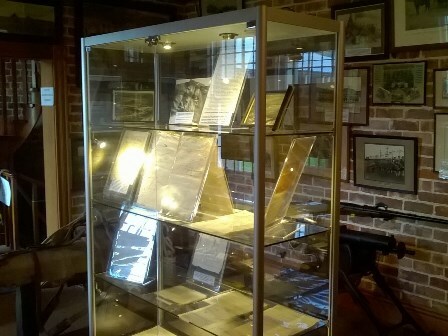 The WW2 room now has new cabinets able to mount a great exhibition of the maps and documents captured in Palestine. 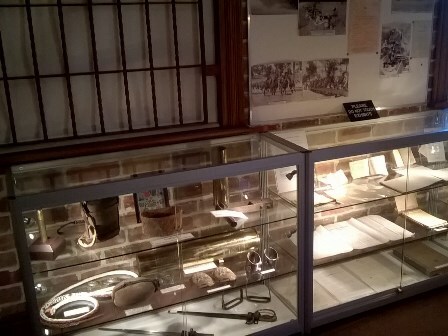 And the NSW Minister for Veterans� Affairs has recently approved a grant to upgrade the lighting in the Museum building; George Glass our sparky is on the job. 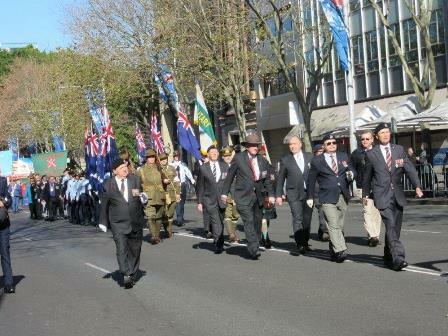 Ian Hawthorn also prepared a special ANZAC Centenary exhibition that ran over two weekends in May. A great display of items that are usually in storage. Our artist in residence David Blackman admires this work hanging in the Museum. 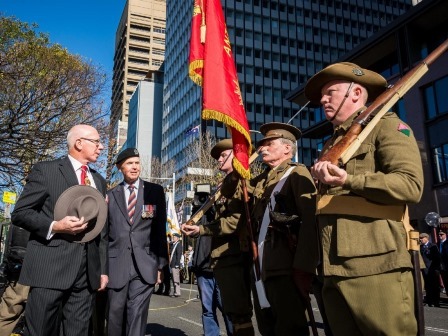 The ANZAC Centenary has seen the number of Museum tours increase. The Museum can be opened, subject to Defence approval, any day if there is a group of at least ten wishing to visit, and a prior booking is made. 2 Div Turns 100 A stop press item only available online. 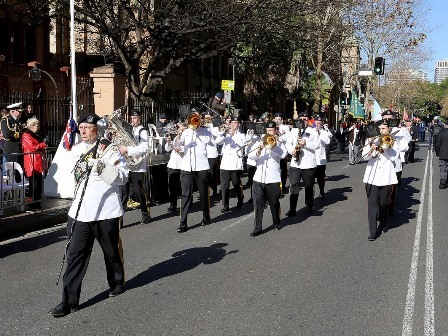 The Regiment was represented in the 2nd Division Centenary Parade in Honour of the 100th anniversary of the 2nd Division Australian Imperial Force at the Parade Ground of the Australian War Memorial on Friday, 24 July 2015. The parade comprised of a 100 person guard made up of soldiers and officers from 2 DIV. All of the Colours, Guidons and Banners of the units which comprise today�s 2 DIV and those Units which have lineage back to the First World War were paraded. 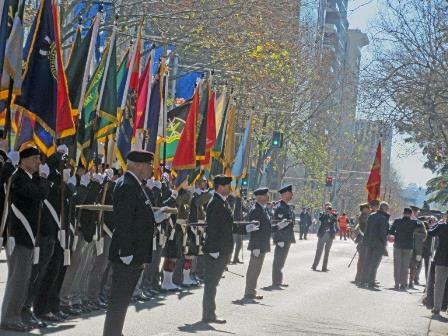 The parade was reviewed by the Governor General, His Excellency General the Honourable Sir Peter Cosgrove, AK, MC. 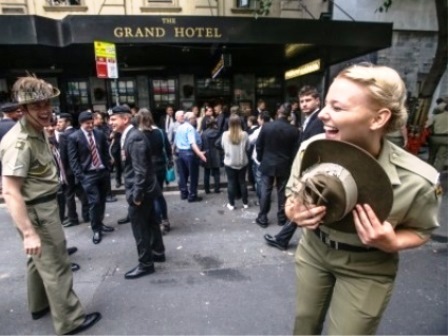 ANZAC Day 2015 was something special. The centenary of that time when the 1st Light Horse was in Egypt, soon to be called on when the landing by 1 AU and the AUNZ Divisions needed reinforcement. 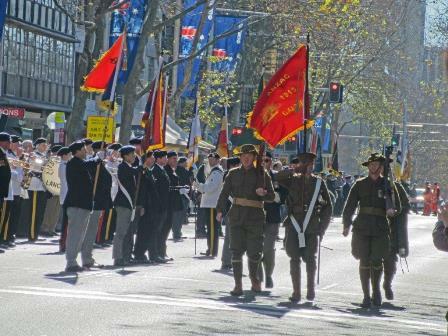 At the parade in Sydney we had a post WW2 contingent of 185, all in Regimental Berets and Ties. Our contingent was by far the largest single one in the parade. Our stock of Regimental Ties with the exception of two was exhausted on the day, and those two have since been sold. Don�t� worry if you need a tie now, the new stock has just arrived. 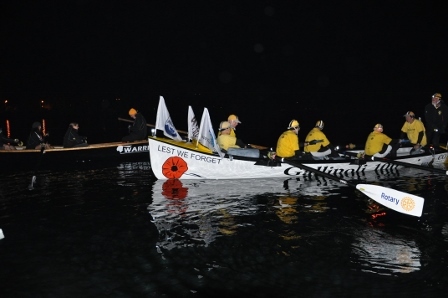 A number of Lancers were also on the Gallipoli peninsula on ANZAC Day to remember those who lost their lives and witness a re-enactment of the landing by New Zealand and Australian surf rowers. Quite a group of Lancers (David Hooper, John Howells, Lee Long, John Palmer, Bob Stenhouse) will also be there to commemorate the centenary of the battle of the Bloody Angle on 7 August 2015. 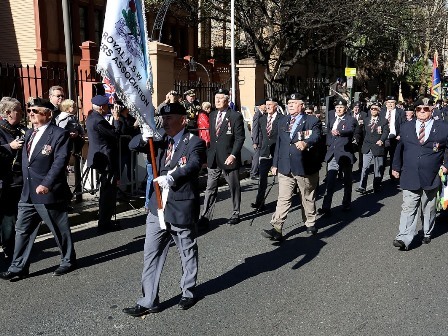 CLICK HERE For the latest update on plans for ANZAC Day, Sydney in 2016. A great showing again on Reserve Forces Day. 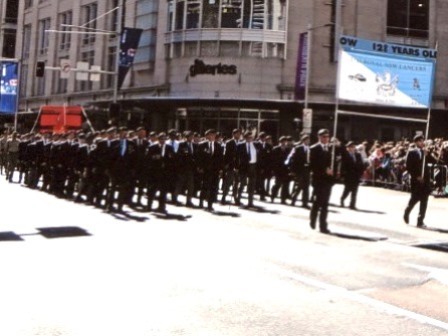 Not quite the 185 we saw at ANZAC Day but again the largest single contingent. You might note that Lancers also form the backbone of the parade�s command group, Parade Commander (John Howells), Parade RSM (Chris Guest), 2 Div Commander (Lee Long), 2 Div RSM (Michael McGraw), 5 Bde RSM (Shane Parker), 5 Bde Standard Bearer (Darren Jones) and the Parade RSM Emeritus (Harry Crampton) without whose direction, the parade commander would have been lost. Just look at the faces in the first photo, taken at the Parliament House reception at the conclusion of the parade. If you would like to see more of what happened on Reserve Forces Day, including taking the time to view the full highlights video (1 hour) then CLICK HERE. Stop Traveller! This ground you come and tread on. Once witnessed the end of an era. On 3 August 1915 the regiment again took its turn on Pope's Hill (Pope's Post), and on the following day Lieutenant Weir and 2nd Lieutenant Campbell, with 23 other ranks, arrived from Egypt. At 04:30 on 7 August the regiment was ordered to attack in co-operation with Walker's Post on the left and Quinn's Post on the right, against what was known as the enemy's "Chessboard" trenches, north of the Bloody Angle. The principal objective of the attack on this date was Baby 700, to the left (north). The troops for its assault were to be the 8th and 10th Light Horse Regiments of 3rd Australian Light Horse Brigade, assisted by the 8th Cheshires and also by the Royal Welch Fusiliers who from the head of Monash Valley would attack the nearer Turkish positions of the Chessboard, eventually connecting with the 1st LH from Pope's. The attack by the 1st LH, which would be directed by Major TW Glasgow, commandant of Pope's, was to be made by two squadrons, about 200 men. Instructions were to go over the top when the 8th LH left their trenches to attack on the left; no shots were to be fired and only bayonets to be used until the trenches were occupied. White patches were sewn on the backs of the men's shirts so that mistakes could not occur in the dark. Rations and water were carried as it was hoped to push on. The attack was gallantly led by Major JM Reid, of Tenter� field, who lost his life. The storming party reached the third line of trenches and held on for two hours, but the enemy attacked in great force and bombed the already thinned-out regiment back. (The ground contested had been fought over by the Royal Marines at the first landing and many of the bodies still remained in no-man's-land.] The regiment lost heavily, 15 killed, 98 wounded, 34 missing (mostly killed), total 147 [These figures differ slightly from those given in the Official History of Australia in the War, 1914-18, Vol. II]. The casualties included all the officers of B Squadron; Major Reid's and Lieutenant Nettleton's bodies were not recovered; Captain Cox and Lieutenant Tinson died from their wounds a day later. The following officers were evacuated wounded: Captain Holman, Lieutenants Reid, Macmillan, Stewart, Weir, Harris and White, Lieutenant Harris showed great gallantry in leading the advanced storming party, and, although wounded, remained in the foremost position until the retirement. Lieutenant Geoffrey Harris by then a Lieutenant Colonel with an MC and MID wrote up what happened in the RSL Journal Reveille, 1 August 1932, page 22. "At 03:30 hrs � I fell in my little party of twelve bomb throwers and twelve riflemen with fixed bayonets in support. The latter had orders not to fire a shot without orders, but to use the cold steel. We marched silently down our communication trenches to the gully, where we waited ten minutes while the engineers opened the barbed wire entanglements for us to get through. Then up to the waterfall, (which we scaled), to be met by a shower of Turkish bombs before we had time to get into any sort of order. I immediately gave the order to charge and we took the two lines of trenches in our course bombing the Turks out. Meanwhile A Squadron, seeing that we had been forced to show our hand, went over � but were either killed or driven back. In the first ten minutes A Squadron was practically put out of action - over 50% [of A Squadron] were killed or wounded in the first rush. � Our bombers went on and took the third line trenches on a narrow front, we could just see the Turks getting back along their communication trenches. It was just breaking daylight when we went over the hill to be met by the crescent trench, full of Turks, half out their trench, waiting for us. Machine guns were barking on three sides of us. Seeing that we could get no further, I gave the order �Down!� and went to earth just as a bullet hit my shoulder. Sergeant Ellis went down on my right � killed instantly, riddled with bullets at close range � I found a lot of Turkish bombs and secured two Turks as prisoners. Five men came up to my support and we had a bomb fight with the Turks for over an hour, when Major Glasgow, Lieutenant Nettleton, and Lieutenant Weir with 16 men came up to join us and help consolidate our position. � At 08:00 hrs after we had consolidated our position and used up 1,100 bombs which were sent up to us from Brigade, we were ordered to retire as our position was untenable. When we reached our regimental lines I received orders to fall in all men left of A and B Squadrons and get them into line with C Squadron. All I could muster was 32 men of which 24 were wounded. Others came in, but very few. In the morning we had attacked 199 strong." The grit of the men when being carried to the beach was remarkable; some 3,000 passed through the dressing station that day, and boats in strings of four and five, towed by small tugs, took the wounded off to empty transports where accommodation for them was hastily improvised. Much suffering occurred on the voyage to Alexandria, and many wounds were septic by the Lime Cairo was reached. There were many acts of gallantry performed on 7 August, notably those of 566 Corporal TJ Keys, 437 Trooper RC Tancred and 397 Trooper F Barrow in carrying much needed bombs to the forward party over ground swept by machine gun and rifle fire. On 8 August Major Glasgow was confirmed in command of the 1st Light Horse Regiment, which appointment he held until the 28 August 1915; Lieutenant A Chisholm, 2nd Light Horse Regiment, was appointed temporary adjutant. This day, Lone Pine, the objective of the Australian infantry on the right, was gallantly taken and held against repeated counter-attacks. The 1st LH cooperated with heavy covering fire on the Chessboard and from Quinn's. By this time the enemy had some 75mm. guns and mountain batteries firing on the front line. Next day the 1st LH were relieved by the 2nd LH and moved into the Reserve Gully, whence the regiment supplied 50 men each night as supports to the 2nd LH on Pope's. Major Granville rejoined the regiment on the 10 August 1915. On the 12th Lieutenant Edmonds went to hospital and on the 14th Cap� tain WS Lawry was slightly wounded. Casualties were again averaging one to two per day and the strength of the regiment was only 166. On 24 August the regiment sent Captain Smith and Lieutenant Kirby with 50 other ranks to relieve a like number of the 2nd LH at Pope's Post. Four days later Lieutenant Colonel Meredith arrived from Egypt with 56 other ranks and took over command of the 1st Light Horse Regiment from Major Glasgow, these reinforcements bringing the strength up to 222. A Squadron of the 12th LH, numbering 167 all ranks, with the machine gun section of the 12th, was attached to the 1st LH and was known for the Lime being as B Squadron. On 2 September 1915, the 1st Light Horse Regiment was relieved by the 17th Battalion, and moved from Pope's Hill to No 1 Outpost on the left, where much hard work was done in tunnelling, improving trenches and revetting. This work was soon picked up by the men, though it had not formed part of the training in Australia or Egypt, where only a simple form of trench digging had been taught. 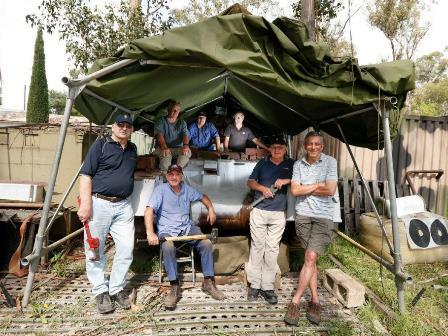 The trench, saps and other works were kept as clean as any peacetime camp in Australia. "Sleeping possies" were dug in the trenches and small recesses well under cover near the various command posts were dug for bombs, small arms ammunition and signallers. 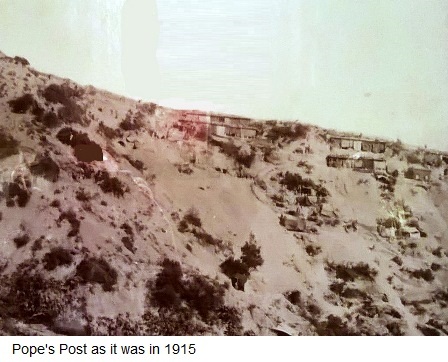 A big trench was dug from Camel Hump to Destroyer Hill, the preliminary work being done at night until enough progress was made to give the working parties cover. On 11 September, 25 men of the 1st/10th London Regiment were attached to the unit for instruction in trench warfare and joined in the working parties until the 15th. On that date Captain Smith and 25 other ranks were detailed for GHQ guard at Imbros, the 2nd Light Horse Regiment supplying 25 men to fill the gap in the 1st Regiment. Dysentery was on the increase, rations were principally "bully" beef and biscuits, and there were flies in millions, By 25 September several saps were sufficiently deep to permit of day working parties. Owing to enemy aeroplanes becoming too cheeky, one NCO and four men were always on duty with a machine gun as an anti-aircraft detail. On 29 September, 45 reinforcements arrived from Egypt. This made the strength of the unit 15 officers and 366 other ranks; there had been no B Squadron left after 8 August, the squadron of the 12th LH being attached to fill the gap as mentioned above. On 2 October Captain White, Captain Stuckey and Lieutenant McQuiggan arrived bringing from Egypt news of the wounded, most of whom were receiving the best of attention in No 1 AGH, Heliopolis, though some had died and were buried at Alexandria. The weather had now got much colder and the sea was very rough. making the landing of men and munitions very difficult; also the beach was under direct observation from the Olive Grove and from a hill near Anafarta. On 11 October Captain Broadbent was evacuated sick and Captain White took over the duties of adjutant. All this time constant work with picks and shovels was in progress; no sooner was one sap completed than some fresh line was commenced: no wonder they became known as "Diggers"! Owing to the wet it was now necessary to revet all steps and rhododendron was cut for this purpose. Wild thyme also grew within picking distance of the trenches, and the men used this to flavour the erei nal bully beef. 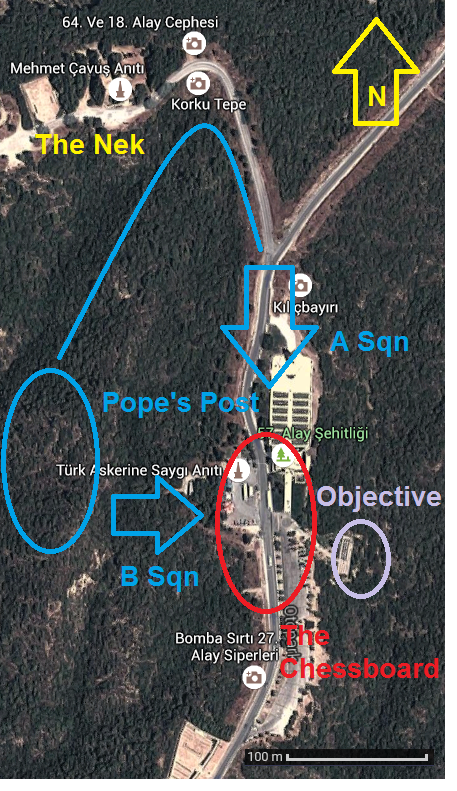 18 October being a Turkish festival day, sentries were doubled and patrols pushed up Malone's Gully where an enemy outpost of four men was located and driven back. Wet weather had set in and sheepskin waistcoats were issued. [The waistcoats, which were of great value in the circumstances, had been provided by the 1st LH Regiment Comforts Fund depot at No 28 Moore Street (now 38 Martin Place), Sydney. This body had commenced operations in September 1914 and it functioned throughout the war. The depot work was performed mainly by a small band of devoted women among whom the mainstays were Mrs HV Vernon (honorary secretary and chief executive), Misses Amy Smith and Joyce Arnold. Other relatives of men in the regiment assisted when available. 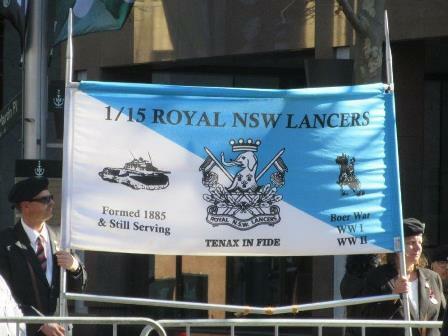 Funds came from donations and from money raising activities of the Sydney and Parramatta Squadrons of the Lancers. Foodstuffs, tobacco, clothing etc, were made up into parcels and despatched on behalf of friends and relatives of the men.] Wood was, as always, hard to find, but some waterlogged spars from the sunken ships, thrown up on the beach, kept the cooking fires going. On the 24 October Lieutenants Weir and Harris rejoined from hospital, in a draft of three officers and 90 other ranks. These men formed the nucleus of a new B Squadron, and Lieutenant Weir was appointed squadron leader. The 12th LH squadron now became known as D Squadron. Great difficulty was experienced in promoting NCO's, the keeping of records in the unit having fallen into arrears. As far as B Squadron was concerned, the nominal rolls had gone with the killed and missing on 7 August. The weather, though cold, had fined up and the sunsets were very beautiful, the island of Imbros standing out in bold relief. The cruisers and Allied destroyers came close inshore and shelled the trenches at the head of Malone's Gully, which must have caused the enemy many casualties. Winter quarters were now being dug by terracing the hillsides, and, although material was very scarce, shelters were erected for cookhouses, etc. The attached squadron of the 12th LH was moved to the left of the post. The following is the nominal roll of the officers of the 12th LH attached: Major PA Chambers, Captain HK McKell, Lieutenants CM Featherstonhaugh, EP Ralston, RK Robey, CA Brough, MA Brown. Lieutenant General Birdwood inspected No 1 Outpost on 3 November and complimented the men on the work done. By now a small steam packet was running to Imbros and the men were able to buy canteen stores, but not in sufficient quantity. Septic sores, dysentery and jaundice were causing daily evacuations to the field ambulance. On 6 November Lieutenant Colonel Meredith took over command of the 1st Australian Light Horse Brigade, vice the recently promoted Major General HC Chauvel who went to the 1st Australian Division, Major Granville taking over the 1st Light Horse Regiment. The command of C Squadron fell to Lieutenant Harris. About this date brigade headquarters commenced a map reading and field sketching school for officers, but few could avail themselves of the opportunity to attend as working parties were required every night and many officers were sick. On 10 November the officers were further reduced by Major Chambers and Lieutenant Wordsworth being evacuated sick. and Major Smith with Lieutenants FCW� Wright and DG Campbell (later transferred to Artillery) and 95 other ranks going to Mudros for a month's rest. All this week the weather was very rough and stormy, the sea breaking up in a single night work which had taken the engineers weeks to do. Winter clothing, including cardigans, vests and underpants, was now issued to all ranks, and trench boots were issued as trench stores. Very heavy rain fell between 17:00 and 22:00 on the 17 November, causing much damage and many washaways in the trenches and saps. Enemy aeroplanes were more active but little damage was done by the bombs. On the 19th the following promotions to commissioned rank were made in the field: Sergeant CW Harris, Corporal HE Wright, Lance Corporal RAL Macdonald. At this time rumours of an evacuation of the peninsula commenced, and on 24 November a period of 24 hours' silence was ordered with the idea of deceiving the enemy and drawing him on to attack; prior to this the 69th Battery had shelled Sniper's Nest with good effect. On the 26th orders were received to continue the silence, but the enemy, perplexed by the ANZAC inactivity, did not show beyond heads and shoulders until midnight on 27-28 November. Heavy rain on 26th and 27th was followed by a short blizzard of snow, and then by two days and nights during which a freezing wind blew. Many men in the regiment had never seen snow before. The constant vigil had a wearying effect on all ranks and proper nourishment was not obtainable; consequently evacuations increased, and it was seen how difficult it would be to get away from the peninsula without great losses if such weather continued. On 30 November Lieutenant Colonel Meredith returned to the regiment, Temporary Colonel CF Cox, CB, VD, having been appointed to the command of the brigade. The cold increased and the enemy made no attempt to attack, thinking, no doubt, the elements would drive the invaders away. Great improvements were made in all trenches, and barbed wire "cheveux de frise" were made and put along the unit's line at tactical points, there being insufficient material to do the whole front. More canteen stores arrived from Imbros on 5 December. The snipers of the 1st LH had by this time gained complete mastery over the enemy snipers, and many of the enemy were bagged. They retaliated by using a new kind of broomstick bomb, with a range of 700 metres. Frequent periods of silence were now observed in order to accustom the Turk to inactivity and thus provide a cover for the evacuation of the whole of the Allied forces on Gallipoli. On 16 December definite orders were received by the ANZACs to leave. Embarkation was to be spread over two nights, known as the "first" and "second" nights, but the exact date was still kept secret. To deceive the enemy and to prevent information from leaking out, batches of men were marched along the beach as reinforce� ments while guns and munitions were loaded during night on trawlers and transports hidden out of sight. On the 18 December Operation Order No l was received to the effect that the night of 19-20 December would be the first night. During the last few days the enemy had been more active; a new battery had apparently got into position as high explosive shells of large calibre were fired into the bivouac area of the 1st LH. On the first night the first party left No 1 Outpost and embarked at 21:45, the remainder of the 1st LH taking over the whole of the line, Camel's Hump to Destroyer Hill inclusive, the section leaders being allowed to pick their own men out of the squadron for the rear party, which had orders to die at their post if attacked. On the second night, 'A' party of three officers and 130 other ranks left the bivouac area at 19:30 and embarked. 'B' party of three officers and 103 other ranks left their positions in the trenches from Meredith's Creek to Destroyer Hill at 21:45 for embarkation. Captain White and 14 men forming the 'C' party remained in this sector until 02:35 and then left for the beach. This left only the rear party consisting of eight officers and 67 other ranks, holding the line No l Outpost to Happy Valley inclusive, under Major Granville, the names of the other seven officers being: Lieutenants Weir, Featherstonhaugh, GHL Harris, Wright, Macdonald, Garbett and Mack. At 03.08 Major Granville received the order to withdraw, but, owing to the signal sergeant cutting off the headquarters telephone, Lieutenant Weir, OC at No 1 Outpost, did not receive the message until he had sent a runner along the telephone line to find the cause of the silence. By 03:20 all the remaining garrison were in Maori Sap running for the beach with socks pulled over their boots to muffle the sound. While they were in Maori Sap Walker's Ridge mine was blown up, whereupon the enemy commenced a tremendous fire on the front and the communication trenches which was kept up long after the party was well out to sea. Parts of the machine guns were carried down to the lighter by the men; the enemy got a certain amount of small arms ammunition and bombs, but most of the surplus and reserve stocks were blown up in Walker's Ridge mine or buried. The fact that the Turks were short of shells and had no trench mortars for use at close quarters had a lot to do with the success of the evacuation of the peninsula. After the long vigil on the peninsula, finishing with the tension of the evacuation, the regiment, when it landed at Mudros, did not look much like the smart 1st Light Horse Regiment that had left Egypt in May. Each man carried some small article of kit in addition to his arms, and the socks which had been pulled over the footwear to .deaden the sounds in the saps were still being worn by many. Scottish bandsmen played the regiment into camp and many army sisters cheered the rearguard as they arrived marching in the rain. Embarkation for Egypt took place on the morning of 23 December 1915, HMTS Honorata taking four officers and 297 other ranks, and HMTS Ionian the remaining 15 officers and 50 other ranks. Christmas Day was spent on board and the skippers and crews did their best to make the day a good one. Next day a landing was effected at Alexandria and troop trains took all personnel back to the old aerodrome at Heliopolis. Orders were immediately issued to re-equip and get ready for mounted work on the western front of Egypt against the Senussi. The saddlery was found to be in good order but the horses' manners had not improved under the rough treatment by the local contractors. Shoeing was pushed on with and clothing issued, and the Gallipoli stoop of the men changed into the old swing of the cavalryman. In the February 2015 edition of Lancers� Despatch, I indicated I had not yet been able to visit end photograph the grave pf Tom Morris the first Australian and only Lancer nominated for the Victoria Cross. This was for an action near Arundel, South Africa. He rescued a comrade, Trooper Harrison whose horse had been shot from under him. To do this he had to ride back into a hail of Boer Mauser fire, an act of great bravery. In late February, I did, it is in in the Corowa Pioneer Cemetery, Federation Avenue, Corowa. Sadly it has no mark on it or nearby to note the stature of the man interred; just a marble inlaid plaque to indicate he lies alongside his wife who pre-deceased him by three years. The country around Corowa is not that different to Arundel where Tom�s brave act took place over a century ago. After the Boer War Tom eventually wound up as a police sergeant in the town of Corowa near the Victorian border. His bravery proven again and again in actions against lawbreakers. My dear stepson is putting together a family tree. My daughter and he are half siblings and he is fascinated by family history. I am very proud of my soldier father, Douglas Alexander "Alec" McPherson, Corporal, and driver of Ace in New Guinea. As time went on he told more stories about his war service, which included seeing shocking things like finding the 'geishas' shot in the head and thrown in the latrines as the japs retreated. (It was many decades before the information emerged that they were actually Korean comfort women captured and sent as slaves.) The Aussie men were dismayed by this, and as a country man and a natural gentleman, Dad was really moved by this particular atrocity. However, he forgave the Japanese, and held no prejudices as time went on. Dad was severely effected by catching dengue, jap dysentery, and malaria, all at the same time. He was shipped home a little while before the Regiment left New Guinea, weighing 38 kilos at 185 cm tall, a living skeleton, to Concorde to recuperate. He then went to Borneo to rejoin the Regiment, but the extreme fever and nervous system trauma left him with grand mal epilepsy. He had his first seizure on parade in Borneo with his squad, they tried to cover up that something bad was happening but it was just too severe. Apparently Ace was a particularly good machine and never broke down. I'm assuming that after Dad was shipped home ("every other bloke on the plane was bomb happy" he said), another driver would have taken over. I'm not sure at what point on the Wareo track that Dad left. But I think he went most all of the way "chasing the Japs" out of New Guinea. I always assumed that Ace was left in New Guinea. Dad said that the boys put the tanks in gear, got out, and sent them away over a gorge, and that Ace climbed the highest up the other side before she stopped. But the boys in the Regiment must have told him that story after they left Borneo because from what I read the tanks went to Borneo. So did the boys send the tanks away on a driverless Journey to the scrap heap there? From what I learnt reading the Lancers' Despatch they were meant to be scrapped, maybe someone went out and retrieved them and tipped them into the ocean. 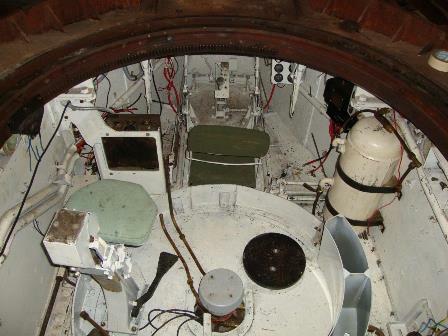 (I have seen several tanks on the ocean bottom in my scuba diving adventures around the western Pacific but they had fallen off the decks of ships.) 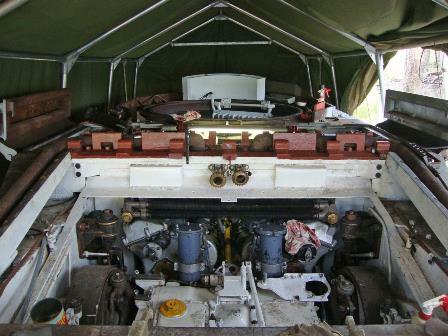 Then it was said in the Lancers' Despatch that she was back in Australia being restored. So how did Ace get back? A mystery! Dad would be over the moon to hear this story. I do remember that his feelings about her being left to rot were not that positive. 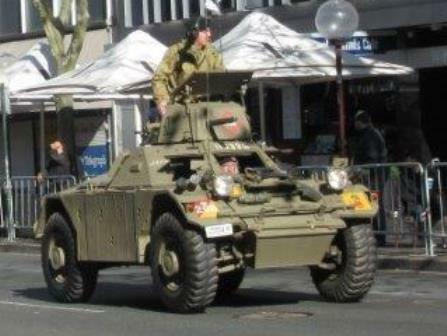 These faithful well designed machines ..... he watched The ANZAC Day Parade every year, looking for his mates. I became a secondary teacher, and always tried to hide my tears in the beautiful ceremonies we put on each year for ANZAC Day. Dad was fortunate to have our beautiful farm to come back to, in that his disability could be accommodated. And he had an angel on his shoulder, all the calamities that could have befallen him passing out with a seizure around machinery, stock, never did. The old Diggers finally got him a TPI pension for his retirement, and he lived comfortably until dying of old age peacefully surrounded by all his loving family. Vale my beloved Dad, driver of Ace in New Guinea. The photos show ACE and her crew in training and my Dad's discharge certificate. BRIAN EDWIN BOURKE No: NX114685 Brian marched into camp with what was then the 1st (Light Horse) Machine Gun Regiment on the 29 December 1941. He was 18, part of a call up of Sydney�s eastern suburbs youth for the militia. He had recently moved from Coolamon, a small town in the Riverina, to Coogee. "I was a country bumpkin going in with all these intelligent Sydneysiders,� he said in a 1994 letter to me. He had, he said, an "inferiority complex". I met Brian soon after I went into the unit on the 21st of January,1942. We became friends right from the start and I soon knew and always knew him to be a very intelligent, highly principled individual. Brian died the 2 February 2015 aged 91. He had a happy marriage of 65 years to Margaret. They had two children, Mark and Janine, six grand children and four great grandchildren. Mark too, served in the Australian army graduating from Duntroon in 1976 and serving in RASigs. There was a deeply philosophical side to Brian. It was apparent in the way he insisted that when he died he wanted only a private cremation and "no eulogising". He was cremated but there was much that had to be said. This account draws on the splendid speech Mark made in celebration of his father�s life. I draw also on the many letters Brian sent to me over the years. Brian served in the army until he resigned on 3 March, 1977. He reached the rank of major. 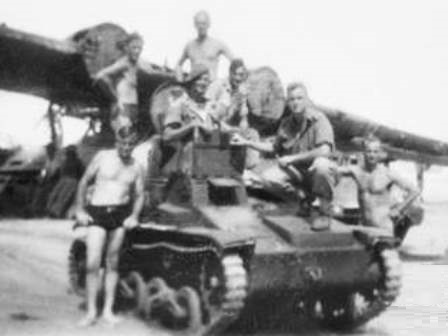 In World War 2 he was in a tank crew in the 1st Australian Army Tank Battalion in New Guinea (1943-44) and the 1st Australian Armoured Regiment in Borneo (1945) transferring at the war�s end to the 65th Australian Infantry Battalion (BCOF) to go with the occupation force to Japan. I think he was one of those who felt the Lancers should have remained an active unit because of our infantry support role. While others couldn�t wait to get out he was to stay in the service. Brian was the eldest of four. He had two brothers and a sister. Their father was in a very successful partnership in Coolamon. He was the town�s butcher and with James Campbell also farmed two local properties running a variety of livestock. Religious prejudice, which flourished in rural Australia in the 1930s, acted against them and brought them down and as a result the Bourkes moved to Sydney. In those years in Coolamon the Bourke boys had excelled in sports and between that and school they took part in the handling of sheep, cattle and horses, sowing crops, rabbit drives, and in the shearing sheds. Brian proved a success as a shearers� cook. In Sydney, it was a difficult time for the family. Brian spent some time jackarooing before rejoining them at Coogee. He worked as a storeman before going into the army. After that life changed. "I really liked soldiering", he said in a 1994 letter. He returned to Australia for a series of courses in December 1946. 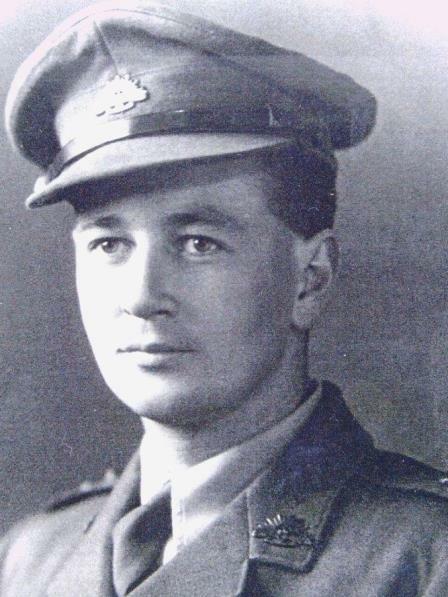 At the Armoured School he met his future wife, Margaret Forbes, where she was a pay rep. Brian returned to Japan to join the 67th Australian Infantry Battalion in 1947. Back in Australia in 1948 he eventually managed to get a posting to Victoria and married Margaret in October 1949. In 1958, posted to Adelaide, he became Adjutant, 3rd/9th South Australian Mounted Rifles. Colonel John Haynes recalls: "I was QM (in 3/9 SAMR). He was a good mentor for me. I was a raw lieutenant and he often counselled and guided me in the �handling� of my staff." Mark spoke of the many happy times the family had in growing up and of the many activities and travels with Brian. Excerpts: "In 1965 Dad was posted to Puckapunyal again to begin formation of the 2nd Recruit Training Battalion � recruits destined for Vietnam." (At Pucka) "� every second weekend saw us on the road, singing songs in the car � Dad teaching us to drive on the back roads .. walks along the Goulburn River Mark falling in and being fished out � trips to Pucka and scrambling over the tanks and firing weapons on the range � In 1966 Dad was posted to the Australian Army Staff, London, for two years � for us image conscious kids tripping around England, Wales, Scotland, Ireland and the Continent in our little Mini and one wheel trailer was downright embarrassing. Dad had us on the road most weekends to see ancient castles, churches and battlefields �" and there was much more. In 1975, two years before he left the army, Brian bought a block of land on Banksia Peninsula on the Gippsland Lakes. They were introduced to the area by Joffre Gilchrist, a notable in the Armoured Corps and they were great mates from when they first met in Japan in 1947. At �Banksia� Brian and Margaret built a house "of steel and besser blocks over several years" � their future home for almost 40 years. Nearby they purchased 40 hectares. In his letters Brian often wrote about the property, running cattle, the farm in general, coping with the damage caused by howling gales, and the many problems of rural life. "Dad loved his time at Aurukun helping Tony and the local Aboriginal community. 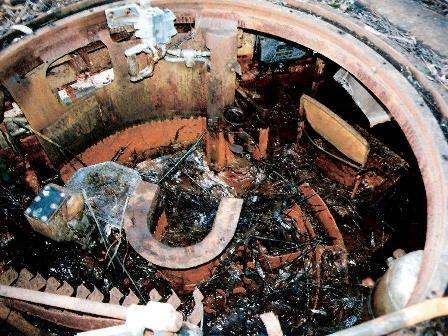 Of note was his building of a butcher shop and what turned out to be an extremely hazardous journey to the Knox River 100 kilometres south of Aurukun in an open boat at night." It�s a story worth telling in full some time. I have a 30 page dossier on the political fracas affecting Aurukun which Brian sent to me imploring me to write a book about it. Often Brian�s letters were long studies of his many interests � notably Lovelock�s "living planet" Gaia, planetary medicine, the Milankovitch effect (changes in the earth�s movements effecting climate), water, pesticides, the Pope, Islam, modern capitalism, Milton Friedman, philosophy, technological singularity, nuclear power, Galbraith, health, medicine, anything which he considered worth serious attention, all accompanied by slabs of literature. Brian never claimed to be an intellectual but he had an insatiable appetite for knowledge, not useless knowledge, but that which he felt would broaden his understanding of life and living. He hated politicians, Big Pharma, and some types of professionals. He was a down to earth man but for all that he was essentially a humanist although he never claimed that either. Above all, he was a family man. 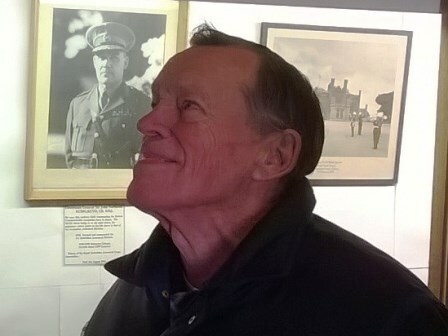 I conclude with the closing words of Mark�s speech: "I would like to propose a toast - to Brian, husband, dad, granddad, great granddad, good friend and gentleman - much loved and sorely missed." Bert Castellari and the Bourke Family. EDWARD (Ted) FALLOWFIELD (NX113814): Ted died on 21 March 2015, aged 93 years and 8 months. He was a driver in C Squadron�s 3 Troop. 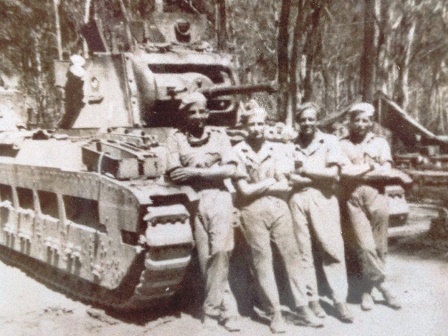 C Squadron had the honour of being the first members of the 1st Australian Tank Battalion to go into action in support of the 9th Division in New Guinea in 1943. Ted had a big family and the story of Ted�s life before and after the war is told here through the eulogy given by his eldest daughter, Beverley Hill, at his funeral. But first, because we often cannot tell where someone served in New Guinea, we have extracted material from the unit history which deals with the part of the Huon Peninsula campaign in which 3 Troop was involved. 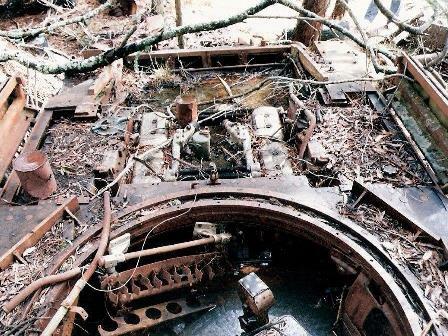 Ted�s tank was named "Colombo". Late in November, 1943, when Sattelberg had been won and the Japanese were withdrawing, D Company of the 2/32nd Battalion had been cut off for some weeks on Pabu, a hill feature commanding the Wareo Track. "D Company was in a bad way, short of food, water and ammunition", the history says. The company had withstood many strong attacks. In support of a move aimed at eventually relieving D Company, Lieutenant Colin Watson was ordered to take his 3 Troop and one tank from 2 Troop to support two companies of the 2/32nd in an assault on Pino Hill which had to be cleared first. The approach lay over steep kunai slopes and patches of jungle. They found the enemy had withdrawn from the area. One tank slipped into a gully breaking a track. 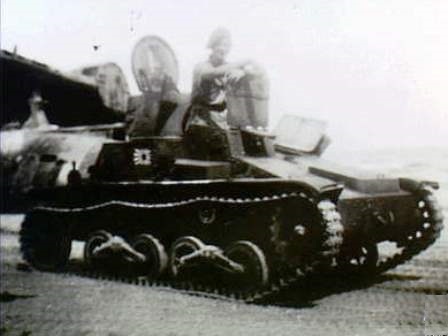 In the meantime an enemy heavy gun shelled North Hill where a number of C Squadron personnel and infantry were gathered around a wireless jeep listening to the tanks. Trooper W. McKay was seriously wounded and Trooper engaged in that attack. The infantry suffered heavy casualties Alan MacKay was slightly wounded. Realising their forces in the inland, north of Sattelberg, were now in danger of being trapped the Japanese commenced a drive to try to regain the North Hill-Pabu area. In the next few weeks 3 Troop tanks working in extremely difficult conditions maintained strong support for the infantry. The conditions of the land were challenging. "The track followed along a high spur with numerous ravines on each side. The coastal track� ran through flat swampy ground intersected by numerous banked creeks � after a time tanks, vehicles and personnel were beginning to feel the strain of the arduous weeks � a grave shortage of spare parts kept some tanks immobile and replacements were not coming forward." The history continues: "Pushing along the Wareo track with the 2/28th Battalion, 3 Troop reached the feature named Oriental, site of a large Japanese headquarters which was given up without a fight leaving piles of equipment behind �(the battles continued) �after days of withdrawals and retreats the enemy stood his ground at �Horace�s Ears� and fought back bitterly with everything he had ... but by dusk the attackers had consolidated on Horace�s Ears� one of the tanks had broken down on a steep kunai incline after forcing its way through thick jungle to clear out several bunker positions. 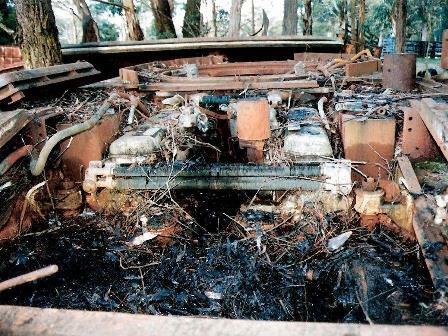 The feature was honeycombed with bunkers and foxholes and the tanks had done deadly work." Beverley tells us that she recently located some of Ted�s own diary of the war. He lists details of the journey to Balikpapan in 1945 then says, "16 July � arrived Balikpapan � 23 Jap raid 8 planes � 25 Jap raid 1 plane � 26 Jap raid 6-8 planes (about 20 bombs)." Soon after, the war ended. Ted Fallowfield was the father of three daughters and two sons. He was the grandfather of 11 and great grandfather of five. Truly a family man. Ted was born in Sydney in July, 1921. At a young age he was taken to Junee, then to a farm, "Hopedale", at Clear Hills, south east of Temora. His mother had married Robert Creighton Isbister, a Shetland Islander who had inherited the farm with his brother. Ted attended Clear Hills school, across the road from "Hopedale�s" bottom gate until he was 15. Beverley�s eulogy continues: "Dad grew up in the Depression. He needed to independently be able to overcome problems on the farm. There were some wonderful stories about the rabbit plague and how he could make a few shillings out of it. "At 17 he was doing farm work in the area and studied wool classing. The exam was in Wagga � so he rode his bike to Wagga one day, did the exam next morning and rode home in the afternoon. We estimate 80 kilometres each way on dirt roads. He was active, fit and athletic � riding his treasured pushbike all over the countryside. He had the frame specially made. Dad had a calm, stoic, quiet attitude to anything that life threw at him. He had a strength and thought �OK � this happened. Now, let�s get through it and keep going.� He was kind. He understood when people were struggling � he�d done some of that himself. He never thought he was better than anyone else." When World War 2 broke out Ted signed up a week after he turned 21. Beverley: "Pop Isbister had been in the Boer War and taught Dad semaphore signaling and Morse code. At one stage Dad said he could do 17 words a minute. His discharge came in June, 1946, and Ted returned to Temora. He met Esma Ruth Hoare at a dance in the parish hall. Mum saw Ted dancing with friend of hers and put out her foot and tripped him up. Thus began a friendship, then marriage, which lasted over 64 years." Ted worked on properties in Coolah and Temora, then drove a school bus �on the Springdale run� during the day and worked at a car yard. Later he was a mercantile agent, had a couple of years at Maroubra where he had a small delivery business before moving back to Wagga. He worked in the gas reticulation department of Wagga Wagga City Council until he retired. KENNETH HALL age 76 No 2773484 died on 21 January 2015 at Yarramundi. Ken was a local, born and lived in Rydalmere. 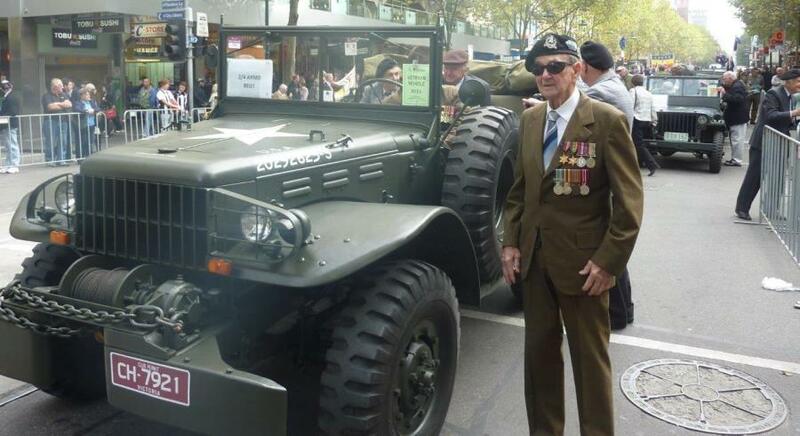 Educated at Parramatta high School, he did his National service 3/57 completing the D&S course for AFV Drivers. Joined the Regiment in 1958 and was posted to C Squadron as a Centurion driver. 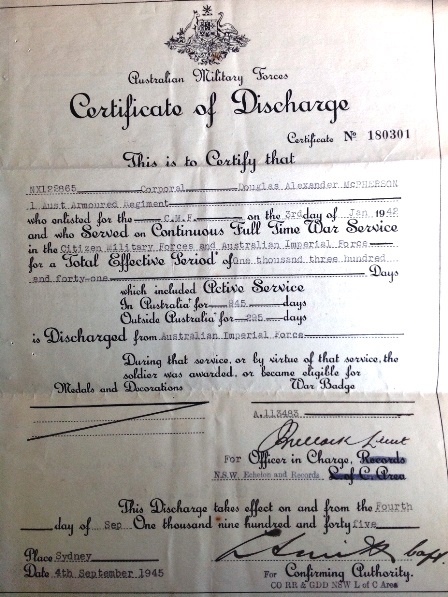 Ken served for several years , due to his Family business commitments he took his discharge. Advised by Bryan Algie. 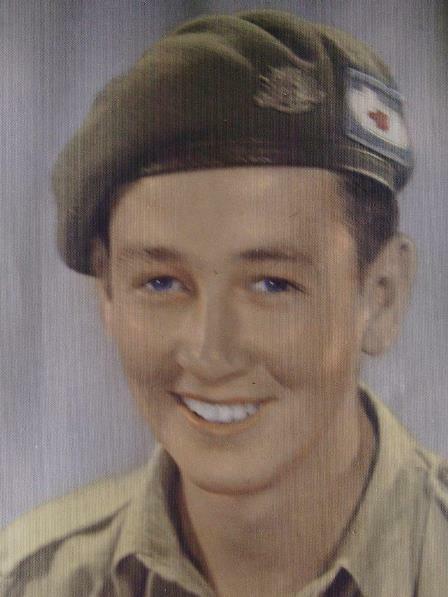 DANIEL MCKENNA 7 January 1924 � 27 March 2015 aged 91 years, served with the 2/4 AAR from April 1942 to June 1946. Following discharge Daniel lived at Kalinga Brisbane before moving to Caboolture in 1989. After retiring from the Brisbane City Council as a panel beater/motor body builder Daniel took up golf as his main pursuit playing as a regular Caboolture club member as well as in the Glasshouse Mts Veterans competitions. Daniel bettered his age at 81yrs scoring 80 on the Caboolture par 72 course. He ceased playing golf two years ago and has spent many happy hours visiting Bribie Island for a �quiet one� in Bluey�s pub gazing over to Moreton Island where he had many a fishing trip with the United Pastimes Club some years ago. 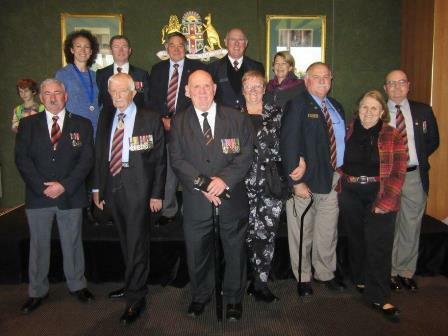 Daniel looked forward to his regimental 2/4th reunions at Tweed Heads and Jack Speares park in Brisbane. 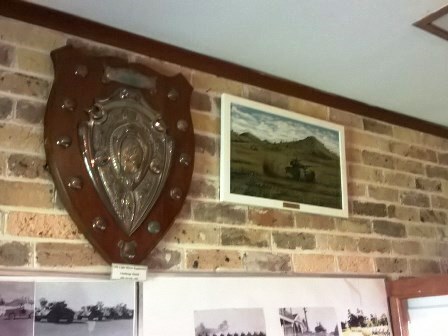 In 1993 Daniel was instrumental in organising the 50th reunion of the 4th Australian Armoured Brigade and laying of commemorative plaques at the Historical Village in 1993 and Pebble Beach in 1995. The plaques were laid in recognition of the amphibious training exercises with the American navy which occurred in the Bribie Passage in 1943. Daniel was meticulous in all he did and the reunion was a splendid success with members coming from far and wide. Daniel was guest speaker at ANZAC day ceremonies at local schools for several years and often spoke of trust and friendship. He lived his life that way and passed away at the Bellevue Care Centre following a stroke. Advised by his son John. WILLIAM PHILIP passed away on Friday 6 March 2015. 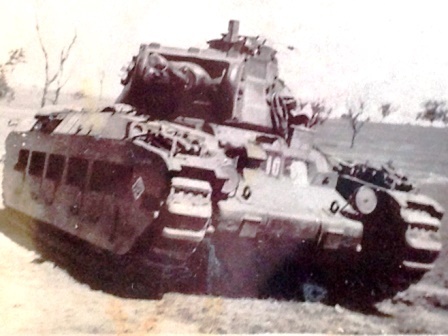 Dad was a former member and served with 2/4 armoured regiment during the war. Dad's funeral was held at the Leura Memorial Gardens on Friday 13 March. Advised by his son Peter. 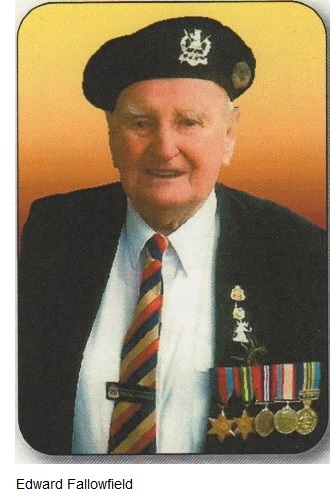 EDWARD POLLEY NX114583, aged 95, on 11 July 2015 at Northwest Hospital NSW, beloved husband of Edna (decd) loved father, father in law, grandfather and great grandfather. 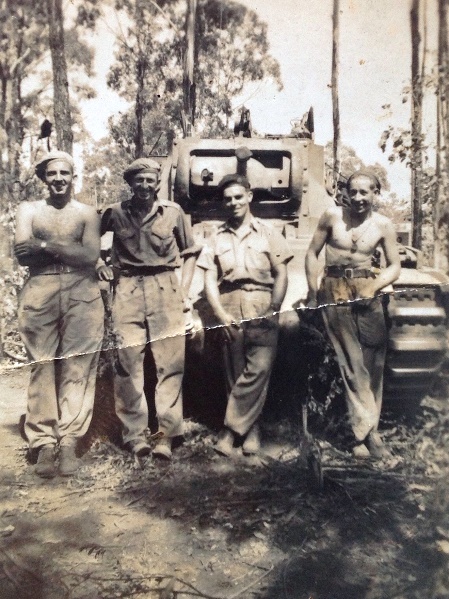 Eddie served with B SQN 1 Aust Armoured Regiment in New Guinea and Balikpapan, as the squadron (sergeant) cook. He lived at Blacktown NSW for many of his later years he suffered ill health spending several occasions in hospital. While in good health he was a keen supporter of the Lancers' Association and the Museum. At the time of his passing I believe he was the eldest survivor of the WW2 B Squadron. Thanks to Reg Gunn for letting us know. PETER QUILTY of Townsville on 20 May 2015. Soon after Peter first joined the Army in 1966, he was posted as Regimental Chaplain to the 1st/15th Royal New South Wales Lancers. 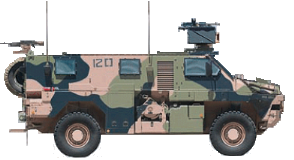 The Regiment, based at Lancer Barracks, Parramatta was at that time an Army Reserve Armoured Regiment equipped with Centurion Tanks, Staghound Armoured Cars and Ferret Scout Cars. He was Regimental Chaplain until 1980, by that time the Regiment was an Armoured Reconnaissance Regiment equipped with the M113 family of Armoured Vehicles. After that time, he served with the Regular Army, then ultimately the reserve again in Townsville. During his time in the Regiment, Peter assumed the callsign on the Regimental radio net of "e;Niner Halo"e;; this callsign was respected and used by all when calling him. Peter�s ministry touched the lives of every soldier. He was respected by all regardless of religion or lack thereof. The secretary of our Regimental Association, sent out a notice of the passing of a Lancer, Peter always replied, noting that he would include the passing in his prayers. Henceforth, we feel certain Peter will continue the service, without the email. 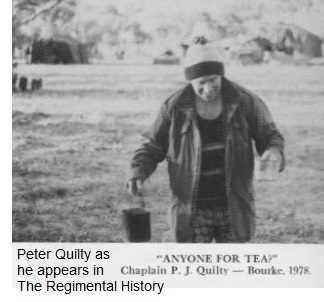 I was very saddened to receive your email advising us of the death of Fr Peter Quilty, the Regiment�s Padre when I joined in 1966. I was most fortunate to have Fr Peter as the celebrant at my wedding to Patricia and we have now been partners for 45 years! He obviously knew good value when he saw it!!!! On one of our Church Parades Bruce Sawyer (a fellow Staff Sergeant who and Regimental character passed away some years ago) and I were given the job of directing pedestrian traffic at the main gates of the Barracks. When Fr Peter arrived he stopped and had a yarn to us both and as he moved on, I said to Bruce, �that bloke married me�. This caused Bruce to give me a very strange look! He was always a welcoming character and great fun to be with during our annual camps. He was a terror of a driver and loved to be able to drive any of the vehicles we had. On one occasion at Puckapunyal he convinced me he should drive the Studebaker 6x6 that I was given. On the range road there were a number of small bridges that were raised in an arched fashion, obviously meant to slow mad truckies down. This did not appear to worry Fr Peter as his speed did not decrease at any time. I also recall that he intended to celebrate mass one Sunday in the Field. This he did with the bonnet of a Landover as the Altar! I clearly remember that he chased, I think Jack Best (another fellow Staff Sergeant who now volunteers for the Regimental Museum) , through the bush, dressed in his vestments, to drag him to the service!! He (Peter) was a great fit for the Regiment and Gay and I remember him fondly as he baptised Andrew (General Glenny�s son) during the time we were both at the Regiment. In my case sad is an understatement. During my 32 years in the Reserve I probably encountered some of the finest men I have ever known, and also some of the biggest bastards. Peter was in the first category and often counselled me regarding my approach to the latter. He affected all ranks of the Regiment the same way even the non-religious ones. A great loss. It is sad to hear of Peter's passing. I knew he was battling cancer for the last couple of years. I am sure that God will reward Peter for the good work he has done in many fields of ministry. He had a wonderful sense of humour and cheered everyone around him. I knew Peter well; he was a couple of years ahead of me when we were studying theology in preparation for our ordination to the priesthood. I was also invited by him to attend his first Mass at Lindfield. Then of course I worked with him in the army, many times we went together to Kapooka to conduct Character Training before my short stint as FTS there. He was always there with good counsel for a homesick trooper, and prepared to back an officer or NCO when it came to practical soldiering. I recall being a troop commander at Singleton in 1976. It was a brigade exercise and some dolt at brigade had issued an instruction that the QM only in any unit could authorise a driver change. When I was approached to authorise a driver change and was expressing my frustration at the edict that said I could not, Peter grabbed the G2, he had just been promoted major (chaplain division 2), he scribbled an indecipherable signature, then clearly wrote in capitals MAJ. That was Peter. Lawrence Anthoney, John	Bartlett, Graham	Bell, Max	Bell, Dave	Blackman, Terry	Boardman, Joe	Borg, Kenneth	Brown, Arthur	Bulgin, John	Burlison, Rod	Button, Ron	Cable, Joseph	Cameleri, Bert	Castellari, Alan	Chanter, Alan	Chapman, Merv	Cummings, Jeffrey	Darke, Glenn	Darlington, Ted	Davies, Paul	Degiorgio, Ian	Frost, Tony	Fryer, Bob	Gay, Jim	Gellett, George	Glass, Reg	Gunn, Alan	Hitchell, Graham Horsfall, Paul	Jankovics, Peter	Knowland , Jon	Laird, Steve	Leslie, Lee	Long, Albert	Martin, B	McEvilly, Sam	Mifsud, Don	Morris, Don	Morris, Jack	Rolfe, Joyce	Sharpe, Arthur	Standring, Bob	Stenhouse, Norma	Swadling, Brian	Turner, Mick	Visinko, Gloria	Warham, Roy	Young. 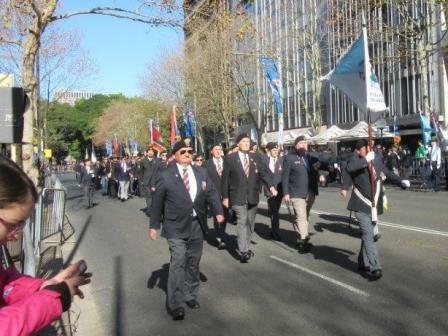 Lawrence Anthoney, John	Arnott, Brett	Barlow, Max	Bell, Dave	Blackman, Terry	Boardman, Cynthia	Booth, Botany RSL Sub Branch, Arthur	Bulgin, John	Burlison, Rod	Button, Ron	Cable, Joseph	Camilleri, Bert	Castellari, Alan	Chanter, Alan	Chapman, Jim	Coady, Maroubra RSL Sub Branch, Pete	Cochrane, Merv	Cummings, Geoff	Cuthbert, Jeffrey	Darke, Glenn	Darlington, Ted	Davies, Paul	Degiorgio, John	Duncan, Bruce	Fisk, Ian	Frost, Tony	Fryer, Bob	Gay, Jim	Gellett, Reg	Gunn, Bruce	Gurton, Alan	Hitchell, Therese	Holles, Graham Horsfall, Peter	Knowland , Jon	Laird, Mary	Lamb, Lions Club of Parramatta, Lee	Long, Danny	Marriott, Albert	Martin, B	McEvilly, John	McPhee, Sam	Mifsud, Don	Morris, Les	Perrett, Doug	Pollard, Michael	Pope, Peter	Quilty, Margaret	Reid, Harold	Roberson, Jack	Rolfe, Joyce	Sharpe, Arthur	Standring, Bob	Stenhouse, Norma	Swadling, Brian	Turner, John	Ward, Gloria	Warham, Roy	Young. Yes we really do need your financial assistance. No amount too large, no amount too small. Click Here to go to the donation page. Donations to the Museum are tax deductible. Don't forget your memorabilia, the online shop now includes Regimental Polo Shirts and has secure payment facilities using your credit card or PayPal account. Click Here for the Museum Shop. Membership of the RAACA NSW is free to all applicants over 75. 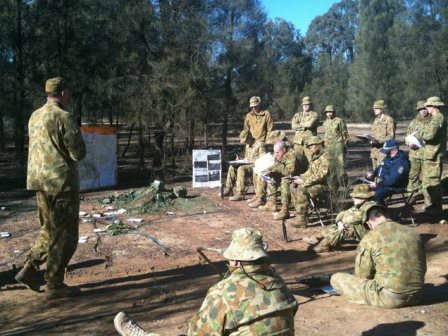 The RAACA NSW newsletter complements Lancers' Despatch, providing news of events in the wider corps community. If you wish to join the RAACA and receive the newsletter, drop a line to the Association at Building 96, Victoria Barracks, Paddington NSW 2071, or visit the website: www.raacansw.org.au. Lancers' Despatch is Published in February and August each year by the New South Wales Lancers Memorial Museum Incorporated ABN 94 630 140 881 and the Royal New South Wales Lancers Association. All material is copyright. John Howells - Editor, New South Wales Lancers Memorial Museum Incorporated, Linden House, Lancer Barracks, 2 Smith Street, PARRAMATTA NSW 2150, AUSTRALIA, john.howells@lancers.org.au Tel: +61 (0)405 482 814, Fax: +61 (0)2 4733 3951.